Social Justice and Empowerment Department, Rajasthan invites online applications for Post Matric Scholarship for the year 2018-19. 1) Students Should Be Bpl in the SC, ST, SBC OBC and Bpl in the General and Disabled, Widowed Child. 2) Income of Parents of SC, ST, SBC Students Should Be 2.50 Lakhs. 3) OBC Students Should Be 1.5 Lakh of Their Parents. as Well as Bpl Card / Endoderm Card Holder / State Bpl Card Holder / Orphan Girl / Divorced / Female Specially Qualified OBC Students Can Fill the Form. 4) Must Be a Regular Student of College or School. To apply for the Scholarship first you have to register your account. Follow the below steps for Registration. Step 1 : To start with, applicant i.e. student visits the Unified Scholarship Portal by opening the URL mentioned above. Step 2 : First-time applicant clicks on the REGISTER button to register on RajSSO portal to get his/ her one-time SSOID/ Password. Step 3 : Upon clicking the REGISTER button, following appears on screen and applicant is prompted to choose a mechanism for creation of SSOID/ Password. If the applicant is already registered on RajSSO portal i.e. already have his/ her SSOID and Password then he/ she can directly click on LOGIN button at Scholarship portal to continue. Step 4 : After Login with your User Id and Password, following screen is presented to the first-time applicant i.e. student and he/ she must select STUDENT option only and click the OK button to continue. ** Since the scholarship schemes are delivered using BHAMASHAH DBT platform, it is mandatory for the applicant to have BHAMASHAH FAMILY ID or Enrollment ID updated in his/ her SSO Profile. 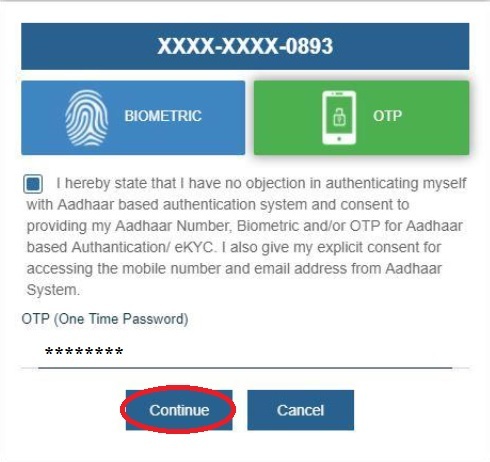 Step 5 : Then, the applicant is required to select his/ her name then specify his/ her 12 digit AADHAAR/ UID Number for verification using OTP/ Fingerprint. In such cases, it is required that applicant first update his/ her AADHAAR in Bhamashah and then continue with Scholarship portal. Step 6 : After successful AADHAAR/ UID verification, the applicant need to fill the one-time PROFILE form. Only few fields and few mandatory documents are required to be filled/ uploaded. Step 7 : After filling all the required profile information, the applicant clicks the SUBMIT button and a confirmation message will be displayed indicating that applicant profile (one-time) has been created successfully on Scholarship Portal. SMS/ Email Notification is also sent to the applicant. Step 8 : Applicant is presented the STUDENT DASHBOARD as shown below. He/ She click on the NEW APPLICATION option in the Menu to submit Scholarship Application. Step 9 : Upon clicking the NEW APPLICATION in the menu, AADHAAR/ UID authentication/ verification takes place. Step 10 : After successful AADHAAR/ UID authentication/ verification, applicant is present with the list of schemes he/ she is eligible for as per his/ her profile information. Step 11 : The applicant selects the desired scheme and clicks the NEXT button. Then fill the Scholarship Application Form. Step 13 : Since the application submission is complete, the system redirects the applicant back to the STUDENT DASHBOARD where he/ she can track the current status of all the applications submitted by him/ her. Follow the below steps to track your Scholarship Application Status. Step 1 : Visit the official website and Click on the Scholarship Status link in the top of the home page. Students who are eligible for the scholarship kindly consider below points, All the necessary documents should be uploaded on the portal after scanning the original copy. 5. Fees Structure (Student are advised to enter fees detail head wise given by the SJE department from your fees structure). I have passed class 10th, can I apply?